Video conferences are steadily increasing as a preferred method of business communication for recruiters. In fact, 87% more people use video conferencing today than they did two years ago. 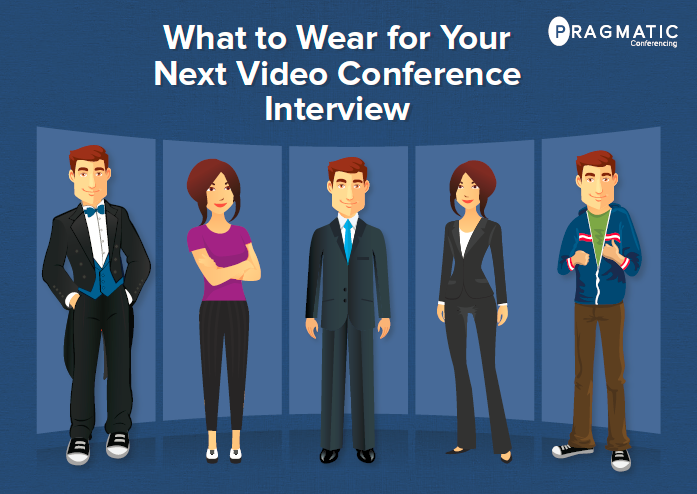 But, as the industry continues to grow, one area of confusion for many professionals is what to wear during a video conference interview. Similar to any in-person meeting, how you look can be just as important as what you say, so it’s critical to understand the proper dress code etiquette. To help guide you through this fashion journey, we’ve put together our best tips for dressing for video conferencing success. The outfit you choose should make you feel confident and put together, but it shouldn’t divert attention away from your message. Overly bright or extremely dark colors do not translate well on camera. These colors tend to appear blurry on screen and may interfere with image quality. Also, make sure to avoid any colors that are too similar to your skin tone or any color that blends in with the background you’re sitting in front of. This can cause the dreaded “floating head” effect on camera. Typically, neutral or pastel tones are flattering, especially cool-toned shades of blue. But, be sure to stick to colors that look the best on you and boost your confidence level. It’s also advised to avoid busy patterns, such as stripes, animal prints, or plaid. Not only are they highly distracting to the viewer, but they also appear distorted and dizzying on camera. A good tip to keep in mind when choosing a pattern is to try not to look like a jungle animal or your grandma’s couch! Make sure your jewelry isn’t overly sparkly to the point that it’s catching the light and creating a disco ball effect around the room. It’s also best to avoid pieces of jewellery that make noise when you move, such as layered bracelets or dangly earrings. Dressing comfortably can put you and your viewer at ease and will allow you to focus solely on your video conference. A blazer that’s too tight will have you tugging at it, either consciously or unconsciously, and create a distraction to the person on the other side of the screen. The same can be said about any item of clothing that is ill-fitted, whether it’s too big or too small. We highly recommend that you choose an outfit that’s conservative, to avoid feeling over-exposed. Be sure to avoid anything that could cause sweating. Wear slightly looser fabrics, breathable cotton, or wear an undershirt to avoid this awkward moment. While it might not be obvious to you, your discomfort will be picked up by your viewer. You should dress the same way you would if you were meeting the interviewer in person. For instance, if the interview is for a corporate job, then dress business formal. What exactly does that mean? Wear dress pants or a skirt, a button-up, a structured blazer, or even a tie. If the environment is more relaxed, the tie and structured blazer can be replaced with casual wear. Both pullover sweaters and cardigans are appropriate choices. Stiff button-down shirts can be exchanged for less structured tops. The dress pant or suit skirt can be replaced with khakis or even formal jeans, depending on the work place. How you dress can have an enormous impact on your audience. A first impression is usually made within the first 30 seconds of seeing a person, and is very highly tied to dress alone. Make sure you look clean, put together, and professional. Certain visual cues, such as stains and wrinkles in your clothing, shouldn’t be visible on your outfit during your video conference interview. These will create a distraction, as well as leave a negative impression. Overall, you want the people you are video conferencing with to remember you by your great ideas and professionalism, not your fashion faux pas. Stick to these four rules and you’re sure to impress every time! With a personal social network of over 25,000 contacts, including 17,000 followers just on Twitter, April’s likeable personality shines across all platforms. Her social media savvy led her to working with Major League Baseball in New York City’s Fan Cave, where, as the first and only Canadian, she connected with millions of baseball fans. At Pragmatic, April leads the marketing team in the management of social media, content, web development, and much more. What's the Deal With Webcasting?